The University of Washington and the Bike Index have joined forces to register and protect bikes for UW’s thousands of campus users. Bike Index, the most widely used bike registration and recovery network in the U.S., allows cyclists to register bikes for free, along with photos and other identifying details. If a bike is stolen, the bike’s information is made available to Bike Index’s 370+ partners in law enforcement, cycling organizations, pawn shops and retail bike shops across the U.S. who use Bike Index to ID and recover stolen bikes every day. At UW, bikes are often stolen by someone outside the UW community and then sold, says Kendra Borzio, a crime analyst at the UW Police Department. Most bikes are stolen from outside bike racks during daylight hours, in public areas. Bike Index’s UWPD registration site gives the UW community a quick, easy-to-use portal for registering bikes via any mobile device or browser. In the event of a theft, owners can use this same site to quickly alert UWPD about the bike theft and the bike’s identifying details, such as appearance and serial number. 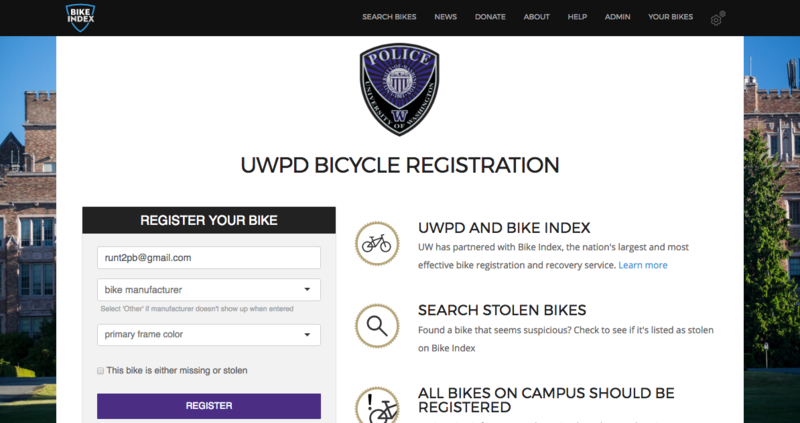 The UWPD Bike Index page is now live and ready to accept student and faculty registrations. UWPD encourages all UW riders to register their bike and upload a photo of the bike. The process takes less than a minute. Bike Index is the nation’s largest and most successful bike registration and recovery network. With over 115,000 catalogued bikes, free, web-based tools designed to offer efficient registration, recovery, and anti-theft services, Bike Index has proven more effective than any service of its kind, aiding in over 3,600 confirmed bike recoveries to date. Bike Index is a 501(c)(3) nonprofit. For more information on Bike Index and how to donate, please visit our About Page or Contact Us. The University of Washington is located in Seattle, WA. One in four UW students has a bicycle, and about 20,000 trips are made to campus on bike each week, according to UW’s 2016 Transportation Survey, published in February of this year. It is estimated that many more ride, just less frequently.